I will use coordinate representations of geometric ideas such as distance, slope and midpoint to classify quadrilaterals. I will use the formulas for distance and slope from my tool kit to create evidence that supports my decision on what type of quadrilateral I graphed. Geometric shapes that we are all familiar with, quadrilaterals can be seen everywhere you look. Inside this mini unit, you will discover how to prove that shapes found on a coordinate grid are specific types of quadrilaterals. 1. Download and print the challenge problem to the right as a warm-up. Once challenge is complete, see instructor for answer key. 2. Test your knowledge of the different types of quadrilaterals by following the link and taking the quiz. You must obtain a perfect score before you can move on to the next section. If you need extra practice on what exactly the different types of quadrilaterals are, please use the link below to refresh your memory. 3. Watch an example of using the distance formula and slope to determine what type of quadrilateral is created by a set of 4 ordered pairs. 4. 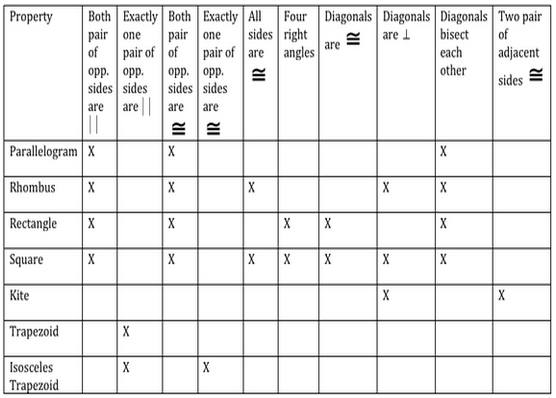 Complete the following worksheet by graphing the provided ordered pairs then finding evidence to support your claim on the type of quadrilateral you just plotted. Follow the link below and watch examples on determining if a quadrilateral is a parallelogram, rhombus, rectangle and square. 5. Now that you have practice trying to find distances and slopes to determine characteristics of a given shape, it is a good step to create a template or routine that you use when trying to solve the problem. I'm looking for a table, set of steps, or layout of work that you can consistently use to help gather all necessary information about the quadrilateral. The most thorough and accurate creations will be posted on this website as an aid for students in the future. Your method could be posted here!!!! For more coordinate geometry problems to either practice your idea or try a new idea out, visit the link above. These questions have links to answers as well that will give you immediate feedback and might help you create a system that works for you.